A fulfilling future belongs to those who have strong vision and resilience. It doesn’t matter where you might be now, starting well and finishing strong is what counts. Shivangi Mathew of Class XI is an avid horse rider who has won several accolades in horse riding. 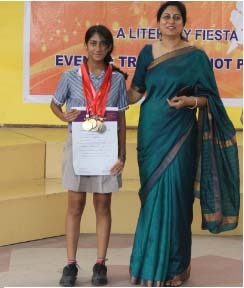 The 15 times gold medal winner of the international Dressage Development League (IDDL) , also a five time silver medal winner of the IDDL in the Equitation Advanced 1B, Equitation basic 3, Equitation basic 4, Equitation Advanced 2 and also a recipient of seven times gold medal for winning the Zonal Gold , Shivangi has also won the Grand IDDL certificate during the International Dressage Development League in 2016 in the overall IDDL International Qualifiers held in 2016 in Canada ,Estonia,Belarus , Germany and India. Good Luck and Congratulations to Shivangi!